Right that's enough from me. England being their Euro 2020 qualifying campaign this evening so we will be back for that later. As well as a via our live text commentary you will be able to follow that game on BBC Radio 5 live. Could England evolution could push World Cup heroes to the margins? Quiz: Can you name the players from England's last win over the Czech Republic? Thanks for joining me. Goodbye. Meanwhile Northern Ireland began their Euro 2020 qualifying campaign with 2-0 win over Estonia at Windsor Park. You can catch up with more from that game here albeit manager Michael O'Neill reckons there is still room for improvement. Former Scotland midfielder Charlie Adam told BBC Radio 5 Live that Scotland "capitulated too easily" in their 3-0 Euro 2020 qualifying defeat in Kazakhstan. 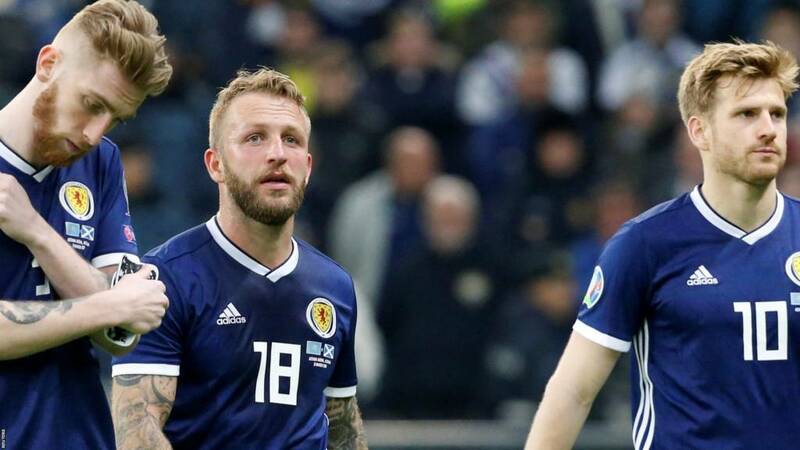 Scotland's loss to the side ranked 117 in the world has piled pressure on head coach Alex McLeish, who Adam says was "let down" by the players. Just have a read of this. England Under-21s extended their unbeaten run to 16 matches as they drew with Poland in a friendly in Bristol on Thursday. The Young Lions took an early lead when Dominic Calvert-Lewin tapped in from Reiss Nelson's low cross. But Poland equalised with a spectacular free-kick from 35 yards from Sebastian Szymanski after England goalkeeper Angus Gunn did away with the cutomary wall from some positions. You can read more about that game here. Mick McCarthy's second coming as the Republic of Ireland boss begins in Gibraltar on Saturday where he will be joined in the technical area by Robbie Keane. Keane, 38, is Ireland's record goalscorer but he isn't putting his boots back on - he is just there to assist McCarthy who has returned to the job he left in 2002. McCarthy's bid to help the Republic to reach Euro 2020 starts at the 2,300-capacity Victoria Stadium. Now time for some more fall-out from Scotland's 3-0 defeat in Kazakhstan. Stoke City midfielder Charlie Adam, who has 26 caps for Scotland, is not pulling any punches either saying the the current squad "let down" manager Alex McLeish on Thursday. But Adam was shocked by the lack of leadership on the pitch. Read more on that here. Jon: Started playing football at 7 in an under 9's league. We lost the first two games 36-0 and 32-0 in 60 minute games. Five years later we got to the cup final as a team. Anon: Not so much a match, but the current Milmoor men's team in the Sheffield and Hallamshire Senior League Division One, have played 21 and lost 21. We have conceded 117 goals in the process and I am the keeper. The Southend United footballer Ben Coker has been chronicling his battle to recover from a serious knee injury on the BBC Sport website. And if you haven't seen this yet this yet it really is worth a watch. Chelsea Women boss Emma Hayes says supporters "should not be discouraged" from travelling to France after weapons were found on a coach carrying Paris St-Germain fans to Thursday's Champions League quarter-final first leg. Up to 50 PSG fans were denied entry to Kingsmeadow, as Chelsea won 2-0. Jonathan: In a local church league game we lost 21-0 where I was man of the match (I was the keeper). Gavin:We got thumped 13-0 in the rain - same day a local news crew decided to use footage for a piece about grassroots football. Cue a cut scene of my own goal being used as background to the entire news segment. Not a fun Monday at school. Thom: I played one game for my school as a last-minute call-up when the whole team were away on a trip. The impact of the 9-0 loss was lessened by our stand-in goalkeeper trying to save a shot and being struck in a rather painful spot. Even the our coach was crying with laughter. We are barely a game into Euro 2020 qualifying and Guillem Balague is nailing his black yellow, and red tricolour to the mast when it comes to predicting who the actual winners of the Championships will be. Just have a listen to this. Argentina's Lionel Messi and Portugal's Cristiano Ronaldo are just in a class of their own (most of the time) but both have been sitting things out when it comes to international football recently. However, that is about to change with both set to play for their countries for the first time since the 2018 World Cup in Russia. Messi is due to start Friday's friendly for Argentina against Venezuela in Madrid, with Ronaldo in the squad for Portugal's opening Euro 2020 qualifier at home against the Ukraine in Lisbon. There's a bit more detail on that here. Fancy a bit of role play? Well it seems the England manager Gareth Southgate is your man. The Three Lions' last victory over the Czechs came in November 1998, and it is this match which has prompted a cheeky little quiz. That game, a friendly, ended in a 2-0 win for England, but can you name the players selected by manager Glenn Hoddle that day, including the two who came off the bench? It's going back a bit I know but give it a go here. Tim: I played for my school's old boys club during sixth form and we lost every game by at least 5 goals. The team got disbanded at the end of the season. Not played 11-a-side since! Ash: Defending cup holders. Picked up the trophy at the league dinner the Wednesday before and had it in the changing room. Lost 3-0 to a team seven leagues below us. We scored two own goals and missed two penalties. Anon: As a 13-year-old playing for Newark boys club. I was a sub and had holes in the toes of my boots. It was freezing and pouring with rain. We went on to lose 38-0 and none of us ever wanted to play again. 20 years later that memory still hurts. Could evolution push World Cup heroes to margins? Now 18-year-olds Jadon Sancho and Callum Hudson-Odoi are both in the mix to feature for England in their Euro 2020 qualifiers against the Czech Republic and Montenegro. But does that mean some of the lads who reached the World Cup semi-finals in Russia and secured a place in the final four of the inaugural Nations League in Portugal in June, could be pushed aside? Our chief football writer Phil McNulty takes a look at the young talent at Gareth Southgate's disposal here. Peter: Played in goal for 5th Halifax/Elland Boys Brigade. We lost 23-0, and they missed more than they scored. It was raining too, and I missed the bus home. Still getting used to Fulham's Ryan Babel rocking the Dennis Rodman look mind! There's a bit more on that here.